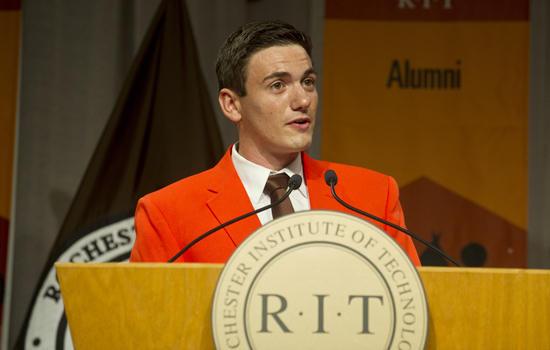 RIT Student Government President Nick Giordano addressed new students at the convocation ceremony Aug. 19 in the Gordon Field House. Hello and welcome to RIT! I’ll skip the rest of the details on me since you’ve all probably done enough ice breakers today to last you the rest of your life. College is the start down your own path of growth. Not just academically, but in all aspects of our lives. Physically, mentally, emotionally and socially. You will not encounter your challenges in college solely through your classwork. In fact, if you only challenge yourself to just get an A in class, you’ll have missed out on the opportunity of a lifetime. Because here at RIT, you have the unique possibility of progressing yourself in every way possible. For instance, our campus has over 200 clubs and organizations devoted to every hobby, sport and community you can think of, giving you not only the opportunity to find new hobbies and hone your craft, but also make lasting friendships and ascend into leadership roles across campus that will give you experience on how to manage yourself and others that no book can offer. Between our fitness center, recreational sports, bike rental, rock climbing, and wellness classes, there is a way for everyone to get involved and active around campus. Improving yourself physically and creating healthy lifestyle changes will not only keep you in shape and motivated now, but putting yourself in that routine will help create healthy habits that last long after you’ve graduated. And let’s not forget the importance of growing ourselves mentally and emotionally. Stress and other frustrations are always going to persist when in such a quick-paced and intensive environment like college. College is hard, and life gets harder from here on. That’s right. It never gets easier. No, YOU get stronger. YOU will become more able to handle the challenges that lie between you and your goals. We are all on that path of growth, and sometimes you’ll have no idea where your path takes you. Sometimes there may not even be a path to follow at all. The path you take from here on out is determined by nobody else but yourself, your convictions and your dedication to finding the way. Now I know you must be thinking, “Oh, good. In order to succeed here, I just have to make everything about myself better in every way, and know exactly who I am and who I will be, and do it all in four years while I’m on some sort of metaphorical path, and I’m lost and alone, and probably hungry. Definitely hungry.” It does sound daunting. To those of you worried if you can do it: the only thing you need to do is look around you. While it’s ultimately up to you to determine where you go and what you do here at RIT, you will always have the support of the community around you when you need it. We are all Tigers now. The faculty, staff, and students you meet here will always be there to help guide and support you, just as you should be right there to support them back. All in all, you are going to have a blast here. It’ll be the best and craziest years of your life. You will learn your limits, face them head first, then break free of them as if they never existed in the first place. So go ahead, make your paths, and we’ll all be here to help you through along the way. Let’s Go Tigers!